There are maybe as many as 60,000 Rendille people. They live in north-central Kenya between Marsabit and Lake Turkana. They are semi-nomadic wandering with their animals to find pasture as far south as Isiolo. They are pastoralists all having goats and sheep, but true Rendille from Korr also have camels. The Ariaal Rendille who have mixed with Samburu to the south also herd cattle. 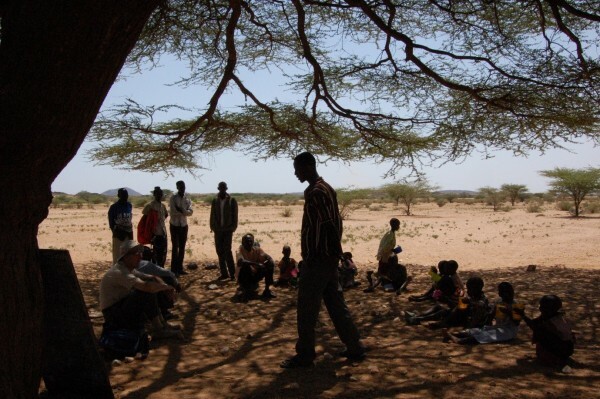 They are largely unreached with the Gospel, especially west of the main road from Merille to Marsabit which roughly marks the eastern boundary. Traditional religion is based on belief in a supreme God (Waakh). There are daily ceremonies like the pouring out of milk in front of their hut in the early morning with prayer; and the elders meeting in a central enclosed piece of ground to talk and pray in the evening, called the nabo. There are regular ceremonies like blowing of animal horns in the evening when the new moon appears. The most important ceremony is sooriyo, which takes place 4 times a year, when an animal is ritually slaughtered, blood is put on camels and houses and strips of skin are tied on head and wrist. Sooriyo and other ceremonies are designed to get Waakh to protect their animals from raiders and disease. Very few of the Rendille who live the traditional life of herding are Christians, partly because they spend much of their lives in remote temporary settlements called ‘foor’ and partly because they are illiterate and there are no radio programmes in Rendille, and also because no one has gone to tell them about Jesus Christ. The main town is Korr where there are over 100 wells upon which many of Rendille depend. Other churches which are found in Rendille are The Africa Inland Church and The Catholic Church which have been here for more than 30 years. Pentecostal Churches are beginning to come in. The first contact was at the end of 1996 in Nairobi amongst Rendille working as watchmen in the city. They came to TBC for hand-outs and a number professed faith. Their Christianity did not seem genuine. After teaching they began to say “Now we know we are not Christians”! About 20 became members of TBC Nairobi from 1998 to 2006. We have three centres in Rendille where preaching takes place. (1) Korr – the main town of the Rendille people. We had been visiting about 2 times a year to make contacts and hold Bible studies. In 2004 we sent two Rendille men who had been trained in the PTC, to start the church in Korr as 3 ladies sent a Macedonian call. In 2006 we sent other Rendille members from Nairobi back home to encourage the work. The church grew to over 30 members. Since then there has been a crisis of leadership – one leader abruptly left, the second had to be relieved of his duties. We sent a non-Rendille but at the end of 2012 we had to terminate his ministry because of gross misconduct. There are 3 local evangelists: none of them with formal training, 2 are illiterate. Yet they are continuing with the work there. We started to visit here in 1998 because the parents of the first young man we had trained were here. 2 ladies had Christian background because they came from elsewhere. One of them started Sunday meetings for singing and praying, which was made up of almost all ladies. Since about 2011 Mario Gambare has been leading worship regularly. He is the Nursery teacher and professes faith but has no Bible training. We have never been able to find someone who has been trained to work in this remote place. (3) Ndikir – 4 villages about 20 kms. west of Laisamis. Raphael Bulkash with his family (wife Lucy and 5 children) ministers here. He is a Rendille, studied veterinary, trained in the PTC, and we have sent him to labour among his own people. He is the only ‘missionary’ we know living amongst the people in their villages. After 2 years in Ndikir there have been no conversions but some are showing interest. in Korr, Lekuchula & Ndikir, based on the principle of working in 2s. 2 Primary Schools in Lekuchula and Losidan – 1 teacher. TBC Nairobi receives designated funds of Kshs. 900,000 annually but the minimum expenditure per year is Kshs 1,100,000, so there is a shortfall of Kshs. 200,000 (about £1450) which has to be made up. There is no funding for increasing support in line with inflation, for a more permanent home for Bulkash, for building for ECDs, for extra gospel workers, etc. TBC Nairobi would like to be able to send brethren to Rendille on a regular basis while there is no trained leader in Korr. We are seeking to see a greater development of the work in Rendille, which in many ways seems to have stood still in recent years. Workers are needed who will faithfully be able to work in this difficult place, so please pray that the Lord of the harvest will raise up such workers. It has been almost 2 years since I have been able to visit the Rendille work in northern Kenya. And this time I would like to bring this to your attention once again. The Rendille are Cushitic, probably of Somali origin because of the similarity of their languages, who inhabit the dry plains between Marsabit and Lake Turkana in northern Kenya. There are about 60,000 of them and those who still are pastoralists remain largely unreached with the gospel because of wandering far and wide with their animals. We have had contact with Rendille people for almost 20 years, first in Nairobi, and then in late 1998 I made my first visit to their homeland, having been told by a missionary that they are 90% unreached. A number professed faith in Nairobi, a few went back home for one reason or another, and we decided to send them all back to form the nucleus of a church, and in 2004 we sent 2 Rendille brethren who had been trained in the TPC to minister in Korr. We have had many leadership difficulties so that presently with 15 members there are three leaders we call Evangelists, who have had no specific training, only one of whom is functionally literate (Ogom). The Rendille who live south of Korr have assimilated to the culture of the Samburu who live yet further south and are known as Ariaal Rendille. We sent a trained brother to the Lontolio area in 2006 to church plant. There has been almost no response to the gospel. One brother who was saved left us to start his own church, and we hope he is seeing genuine fruit. We do sponsor two Primary Schools in Lekuchula and Losidan, and there is another in Ndikir sponsored by Kindfund. In addition to Early Childhood Development (ECD) schools in those places and Korr, we also support ECDs in Dubsahaay Dogo and Lagarama. Village Elders are requesting us to start a church in these places but we have no one to send! In these areas we know of no man who has turned from the traditions to put his trust in Christ. “And how are they to believe in Him whom they have never heard?” We are much exercised about this situation especially with the many young adults we have in TBC Nairobi. I would like to give you below parts of the report that Pastor Murungi wrote after his recent visit October 19-24, 2016. I was encouraged to see the brethren in Korr. I praise the Lord for their full involvement in the life of the church, going by the attendance on Sunday. The two men were profusely grateful for the labours of Ogom in uniting them. Godana said that Ogom, even though younger has been able where the previous leaders had failed. Ogom was embarrassed to hear it. His zeal is in no doubt and he well organised our stay there, with the little resources that they have. I think we need to do more for him financially, because he has effectively become a leader. He is very committed to the work, and he does not have a side job like Godana and Nadesol who both have animals to look after. They still meet in the old structure because they would prefer to start using the new one when it is complete! We began with singing many hymns and songs in Rendille before memorizing verses. Almost everyone gave a verse, even Mzee Esirmidana and his grandson! After the person recited the verse, the rest of the church would be helped to grasp it. Such verses as Genesis 1:1-2, Psalm 23:1, John 3:16, etc. were so well recited. In my judgement the church is doing well. There is spiritual health and vibrancy in the way the singing and recitation of verses was done that was refreshing. As I preached, it felt like I was at TBC Nairobi. The children, the adult the young people, all, were interested in memorization and the singing so that Stanley himself admitted that the ground is fertile for much spiritual growth. We all acknowledged that it was a very reformed indigenous local church, where the Spirit of God is at work. gospel passage. He was categorical about sin, and the wrath of God in condemning sinners. He was very clear about the Saviour Christ. He also emphasized faith. He is good in evangelism and some guidance will help him to see the need and the how to plead with the sinners to flee for their lives to Christ and take their sins to Calvary. His desire is to go there. I think that he could be greatly used of God, since the Lord knows how to use us with all our deficiencies. He is interested in the TPC which, we hope could build him up for ministry in the areas of weakness. He could be an effective pastor – I believe he has the potential. He has the resilience necessary for Korr. He has interest in the place. He liked the church. I think he may be tried by going there for a month next year, possibly after the TPC in January. He should keep a daily journal/log of what he does with his time, as a way of developing him. The church structure stands tall with the pillars but is not used. The brethren have opted to remain in the same old structure as the new one is completed. I encouraged them to make use of it, but they were not enthusiastic about it. I believe the building should be completed soonest. This will encourage the brethren to know that we have long term goals for Korr and Rendille work. The rooms which could be used for accommodation should be well furnished for future guests like us. We had to rent a guest house for accommodation because of the pathetic state of the church hut and beds. The wire mesh has come off, only two metal bars stick out. The first night was so uncomfortable and tiring. New beds and mattresses are needed. We thought that men in the church in Nairobi could be called upon to take a trip to Rendille for a week or two and help a fundi (skilled artisan) to complete the structure. The roads are good, and one no longer needs a 4X4 wheel vehicle to go there. The state of facilities in the schools we sponsor is dire. We need to urgently work on the church building for the sake of the nursery school in Korr. The Dubsahaay Dogo Nursery is still meeting in the school that George Galale heads. By the way he came to worship with us on Sunday. He said that if the church got another pastor, he would consider coming back because he regards TBC his church. and we should send them a pastor and look at the needs of the school. Nduruba (the one professing Christian) was away in Laisamis but the husband was home and was so excited to see us and slaughtered a goat for us! Matthew, the ECD teacher we helped to put through training, encouraged us to send a pastor in Lekuchula. He said that the villagers love Trinity and would not welcome anyone else. But since they do not have a choice, the influence of the nearby Namareey Catholic is strong and the children are being influenced. He admitted that he is not saved yet, but would like to see TBC take root in the area. The school in Lagarama is continuing according to Matthew and we should consider starting another school in goob Haragura. For photos of Lekuchula and Lagarama please visit www.trinitybaptistkenya.org/rendille-ministry. Antonella requested us to support her son to go for the ECD training in Kianjai and I took his certificates. He teaches the nursery at California and is happy to spend the rest of his life as a teacher. Esirmidana also asked for more help because they could barely survive on the 4K we give (he and his wife are old, live in the church compound, have nothing except what we give). Mama Diba (a widow) also requested for more help but I pointed out that she does nothing in the church compound anymore and so thorns were growing so fast. She said that she will help in uprooting the smaller ones and the men can do the bigger ones. All the men asked if we could increase their monthly financial support we send them because are great. Godana for example was saying that fees for his children is overwhelming him. He was so grateful for the help with Khobosha (Teacher Training College), Maka (University) and Grace (going into a Secondary School for the Deaf). The needs are overwhelming, both the spiritual and the material. Please pray for preachers of the gospel and for the Lord’s mighty hand of grace to be stretched forth in the salvation of sinners. The children of the leaders and other poor people need help with their school fees at secondary and beyond otherwise these families will never be able to be self-supporting. Please consider how you might be able to help and make the needs known to others. All such help is being coordinated through the charity TRAIN (Kenya) and for details please look at the website www.trainkenya.com. Normally meet on a Sunday at 9.15am when they sing hymns, recite memory verses, read the Bible. Have a Bible Study, a Children’s class, Adult Bible Study class. Been going through Hebrews and are now having a study on the Holy Spirit. By 11am start Sunday service at which reading through Isaiah, and preaching through various books. In the afternoon at 3 p.m. have done Proverbs. Tuesdays – visit manyattas that are far away, leaving at 8.30 am. and returning by 6 pm. Wednesdays – Bible Study at 3 p.m – studying Ephesians. Fridays – visit nearby manyattas. Saturdays – meeting for mothers. People are receiving the Word of God despite their culture. They request a return visit because they like what they hear, but after 3 or 4 days they have forgotten what they heard. The effects of the loss of Peter, and the need for another to replace him. That members will not defect to other churches. I made another visit to Rendille with Peter Kivati from January 27th to February 5th. The three leaders in Korr faithfully go out to the surrounding goobs to preach the word but very little fruit is seen. We talked about why this might be. They responded that people are listening more intently these days, not like before, and there are a few men who are showing much spiritual seriousness. They also said that generally people do not respect fellow Rendille who come with a new message, thinking they are no different from them, and to back it up they quoted, ‘A prophet is not without honour except in his own country’. They think there is a great need for someone from outside the Rendille community to come, who will be better listened to, and who will be able to give them more training in the Scriptures. Peter and his wife have indicated their interest. There is now another Protestant church in a nearby goob and we encouraged Wareiya to attend there at least. Sadly other Churches do not believe the Rendille must forsake their traditions and turn to Christ (as 1 Thessalonians 1:9-10). They tend to cite the outward similarity of some of the traditions with the Old Testament – use of animal blood on entrance posts to their homes, burnt offerings under special circumstances. If the continued practice of their traditions is incompatible with genuine Christianity, then there are very few genuine Christians! Please continue to pray for the genuine preaching of the gospel of Christ, that our brethren will not be discouraged, and by the Lord’s mercy they may begin to see fruit for God’s glory. The great need continues to be for the Lord to send preachers. We have been going to the communities of Lekuchula since 1998 but no one has assuredly professed faith although a number say they are interested. We have never had anyone to minister here week by week and we believe this will be necessary for the ministry to develop. We sponsor the school so we could teach the children the word of God, if there is someone willing to do so. But who wants to live in such a backward place where everything is difficult? But it will not be backward for long. A main hard-top road will soon go by the school, because of a big project near Lake Turkana to generate electricity from wind power. Pray for Raphael that the Lord may encourage him at this time. He is basically working alone, is unique in that he is not living in a town but where the goobs are, and he has seen little true interest in the gospel. We have provided a motorbike for him but punctures are frequent because of the thorns. We have directed him to look for the one or two who show special interest and spend more time with them. We also want him to go to the school at Losidan every Friday to teach the children, which he has been doing. The community leader in Losidan challenged me to put up a church structure (of corrugated iron), which I have agreed to do. It is not our usual policy, but it is necessary to keep a foothold in the community and we pray the Lord will raise up a labourer soon. The Lord has given us two opportunities on radio to bring the gospel to the Rendille. Raphael Bulkash broadcasts in the Samburu language of the Ariaal Rendille on Trans-World Radio. Stephen Silamo broadcasts live on the national radio in the Rendille language, both on Wednesday and Sunday afternoon for an hour. May the Lord mightily use these opportunities which are freely given.